With just five ingredients and less than 5 minutes of prep time. This is one of my favorite easy Easter side dishes. Nana’s Corn Pudding packs sweet corn flavor and the perfect side for any holiday. Holidays like Easter are always steeped in tradition. In our house, it was always ham, mashed potatoes, hot cross buns, and lots of eggs. Then there was the ever present Brussels sprouts covered with the mock hollandaise. They were not roasted or even sautéed. Just don’t go there. With my family now, we have a few traditions, but not many. Like, we always have ham. Though, I’m thinking of changing that up and maybe trying a leg of lamb some year. Not this year though. We always have green bean casserole. That’s at almost every holiday. The hubs loves it and it’s growing on me. Scalloped potatoes or au gratin potatoes are always on the table at Easter. Because, well, ham and scalloped potatoes are a match made in heaven. Heck! Potatoes and cheese are a match made in heaven! But, that’s not what this post and this recipe is about. This is about Nana’s corn pudding. A recipe that was published in her church cookbook. Yes. I have it. It’s on my shelf along with the few other cookbooks I keep. No. I’m not a huge cookbook recipe maker or cookbook collector. There are a few that I cherish, a few that I love and have used, and a few that I hope to use to learn from. Now, Nana, on the other hand, I could always learn from. She was a genius in the kitchen. Her chicken and dumplings were off the charts. She could make the best gravy out of anything. Her sausage gravy though? To die for. Especially on top of her biscuits. Man, those were the good days as a kid growing up in the south. When you knew what sorghum was for and used it. What I remember most is her corn pudding. It tastes delicious yet super simple. And, it can be used for many main dishes, I have found out. You see, there’s a restaurant that we used to frequent at work called Chevy’s. They served up a corn side dish that tastes quite similar to this corn pudding. My boss at the tame always raved about it and I swore to make some corn pudding for her. Well, I finally did for a Christmas party and she agreed that Nana’s corn pudding tasted just like her favorite side dish at this Tex-Mex restaurant. I left her the easy recipe and she was thrilled. A happy boss is always a good boss, right? Nana’s corn pudding has 5 ingredients. And they’re pantry/refrigerator staples at that. I always have cans of corn and creamed corn. If I don’t have the corn muffin mix, I can easily whip some up. It’s just some flour, cornmeal, baking powder, sugar, and salt. There’s plenty of copycat recipes out there where you can easily whip up your own batch of muffin mix to keep in your pantry. This is one of our family’s favorite easy Easter recipe side dishes. It literally takes minutes to prep this recipe and pop it in the oven. It takes longer to wait for it to cool before serving than it does to make this corn pudding. You can’t get any easier or simpler than that. And just look at that deliciously golden color! It has the perfect amount of sweet combined with corn flavor. Yet, it’s easily adaptable! Add some jalapenos or green chiles and toss in some cheddar for a kicked up Tex-Mex version. Stir in some sun dried tomatoes and mozzarella for an Italian version. How about some roasted red peppers and feta for a Mediterranean flair? You see? It’s so simple that it can be kicked up any way you’d like. Add some sliced hot dogs or kielbasa and make it a main dish! Stir in some leftover Easter ham or rotisserie chicken to repurpose left overs. Make it a pizza style with some pepperoni, roasted red peppers, and sun-dried tomato pesto. Only your imagination can limit the possibilities. I can see those wheels turning. You’re using your imagination to not only taste this delicious corn pudding but mixing it up with your favorite flavors. That’s how recipes are intended to be used! They’re just a guideline, really. Swap out ground chicken for beef in a meatball recipe. Change up the cayenne and chili powder for some paprika and turmeric. Things like that make a recipe truly adapt to your tastes and palette. Okay. Enough about all that. 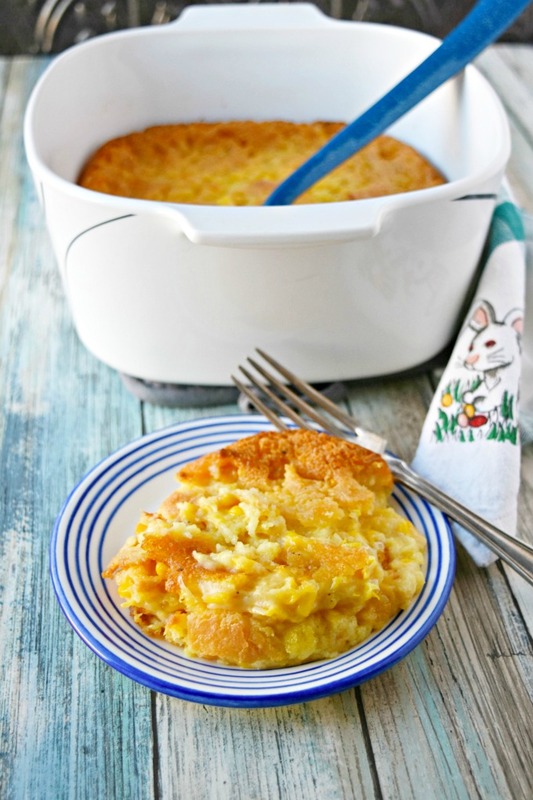 Traditionally, we serve Nana’s corn pudding at family gatherings like Easter and Thanksgiving. At least from what I can remember, which isn’t much. However, I do remember it tastes amazing. It’s the perfect balance of flavors with plenty of corn flavoring to make it vegetable-ish. Of all the times I’ve made this recipe, I can’t believe I’ve never shared it. Then again, I think it goes in that category of family recipes that I don’t really want to share? Because they’re, well, family? I’m a bit strange with that. I know. Slowly I’ll be sharing more and more of my family favorites. So, just stay tuned. What do you traditionally serve for Easter? Do you change it up or serve the same things every year? I hope you find some new delicious easy Easter side dishes for your family. Put the butter in a 9 x 13 casserole dish. Place the casserole dish in the oven to melt the butter. While the butter is melting, combine the remaining ingredients in a medium mixing bowl. once the butter is melted, pour the corn mixture into the casserole and bake at 350 for 40 to 50 minutes or until the center is set. Remove from heat and cool 10 minutes before serving. Wow this looks so delicious. I love corn and corn pudding. I’ve been dying to try a corn pudding! Can’t wait to try this one! I hope you enjoy it! It’s a classic one for my family. Sorry. Was having plugin issues. It’s anywhere from 2T to 4T. I used 4T. Yum! Looks like a very tasty family tradition. 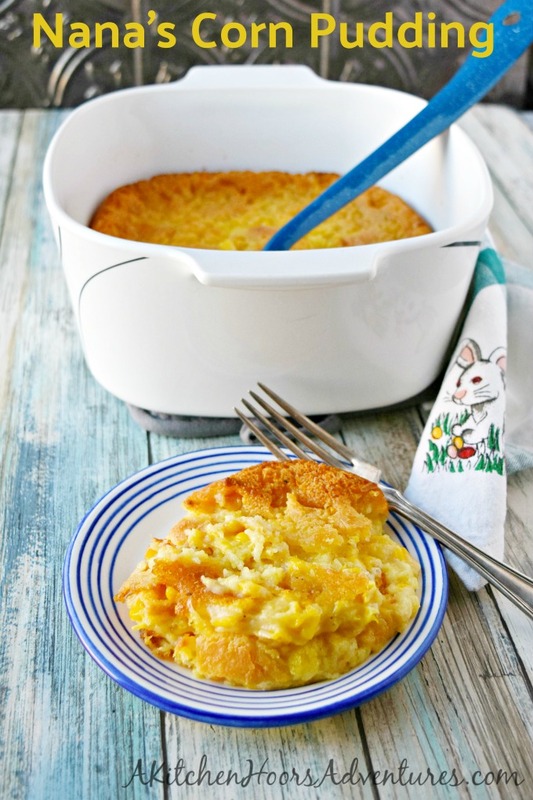 Oooh, what a yummy, easy corn pudding! Perfect for any holiday menu! Hats off to your Nana for sharing her recipe! I’ve had corn pudding but never tried to make it! You should, Cindy! They’re so easy and delicious.